Twitter is one of the active social media platforms that get you followers in no time. But, you can’t earn their credibility without knowing some factors that really works here. These factors can also be said the Twitter mistakes that you should not make while doing activities on your account. Twitter and Time can be a Match, How? The main purpose of tweeting and getting retweets by the followers on the post largely depends on the time it was posted. A smart businessperson never tweets at midnight as the followers who would “like” and “retweet” the post may be asleep. Too many or too less hashtags in a Twitter post, either of them won’t get you anywhere. Hashtag gets visibility for your brand at a higher rate on Twitter. In fact, Offerpop, an online social marketing platform revealed all users who add hashtag in their Twitter post, more than 70% of them use hashtags through their smartphones compared to those only 30% who use hashtags through their computers. Hashtags get you popular on Twitter but make sure you are using two hashtags per tweet or per post. Twitter allows a limited number of characters for every tweet as being programmed for users who are on-the-go. If your tweet characters are too long, users would try to skip it. Post short and catchy tweets. Social Media Examiner says that tweets with fewer characters have 17% more engagement than other users. Short tweet gets you easily in conversation and encourages a large number of audiences for retweeting and commenting. In general, people don’t ask for retweets. Although, for businesses, it won’t be any excuse to be hesitant to ask for this. Asking for retweets is a great opportunity, but most of the brands aren’t able to recognize it. Studies reveal that asking for retweets gets 12 times and even more times RTs. Additionally, use of the whole word “retweet” acts 23 times better than its abbreviation RT. Again, this request should be done occasionally, if you use it frequently that might annoy your audience. Are you posting too much on your Twitter account? According to a Forbes article, “the more you tweet, the more likely you could have followers”. But, this isn’t completely right. However, if you do a lot of postings that would increase your company’s visibility, but too much can again annoy your audiences. 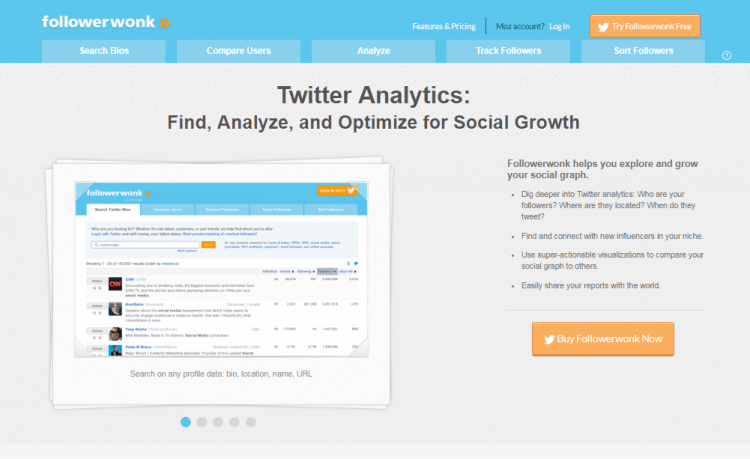 You can search relevant key terms as per the nature of your industry and you can also see the headlines having the maximum response rates with the help of Followerwonk, a free tool made for Twitter users which would help you to expand your social connections. Through the help of the tool, you can get engaged with your followers employing the required keywords. Suppose you clicked on a link, but it doesn’t open and worse than this could lead to a virus. So, make sure whichever links you are adding to your posts are double checked. If you add links which contain errors, that might lose the interest of your audiences in your page. Hopefully, you would never like to send them away, isn’t it? You should focus more on the content which you publish instead of your number of followers. Your social media strategies should focus on creating and sharing content comprising quality and reliability along with target audience.